You've had a very diverse career from doing Lost on TV to movies, and in the roles you've played. What motivates and inspires you to take on a character or project? I suppose what motivates and inspires me is a role/project that challenges me in a new and different way. There's also that instant connection with a character I feel when I read a script and would die to play her...hard to verbalize but it's just a feeling I get when I read something I love. 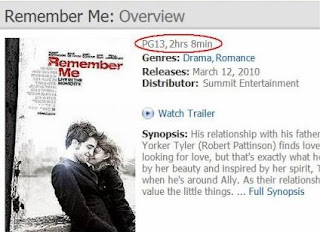 What does "Remember Me" have that makes it different from common romantic stories? The characters are so beautifully unique and their relationships break the norm. It's a reality driven piece that depicts so many parts of a relationship. Not just Ally and Tyler's but their relationship with their families and in turn, how that effects them. What was it like to work with co-star Robert Pattinson? Did you spend time getting to know each other before filming or during to create chemistry? We had a really great time working together. Instead of just doing a scene and reading your lines, it felt like I was just reacting to him and the situation which made it feel very natural and un-forced. Probably the case because not only did we get along really well- we made a point of being on the same page as each other to do with our characters' relationship. Not reading over and over scenes, but more talking about them and our characters and finding moments one or both of us hadn't noticed before. I think really getting to know someone helps a lot with having believable chemistry on-screen. Other than the Ally/Tyler relationship, which do you think is the best relationship in the film and why? Ruby and Rob who play Caroline and Tyler-They had such a great chemistry together. Even though there's a big age difference between the characters they have such an adult relationship. Tyler could not be more caring and protective of Caroline and goes to great lengths to try and make her father understand and be there for her. Ally is such a strong yet sweet character. Was it difficult to balance those qualities in your portrayal? It was in a way, although Ally and I have some similar traits it's more challenging to not just play a version of yourself, but rather use those similar characteristics and develop a totally new character. These photos were posted on Fan Forum by LilMouse so i would like to thank her for the heads up!! 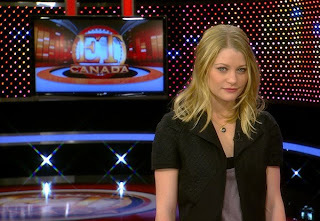 TORONTO — "Lost" star Emilie de Ravin says she's excited to be back as a series regular on the final season of the sci-fi smash. She says it's been especially challenging now that her character, the young mother Claire, has suddenly emerged as a violent and unpredictable force on the show, about a plane-load of castaways marooned on a strange island. The Australian actress was written out of the previous season when most of the characters escaped the island for three years, leaving Claire behind. During a stop in Toronto to promote an upcoming film, de Ravin says Claire has been through a lot since viewers last saw her, and has had to rely on a reincarnated Locke as her only friend in the jungle. De Ravin says Claire's only focus has been on finding her son Aaron, and that's built up a lot of frustration and anger which emerges in violent and unpredictable ways. She says she still has several weeks of shooting left on the show, and is as mystified as fans are as to how things will wrap up. "It's been really fun this season because not only can I still play sort of the old Claire, or the original Claire in flashes, but ... three years has taken a bit of a toll on (new) Claire and she's a little different right now," de Ravin said Thursday while in town to promote her upcoming film, "Remember Me." "She's been living on her own. Her only contact has been with Locke who is no longer Locke, or as she calls him, her friend. Her only objective in these three years ... is to try and find her son, to try and find Aaron. That's all she's been trying to do and it hasn't worked so there's quite a bit of built up frustration there as well, which comes out in quirky ways but also violent ways and unpredictable manner." Last Tuesday's episode was full of surprise revelations involving a gun-toting, wild-haired Claire and the other castaways. While Claire appears to be under the sway of a nasty version of Locke, Jacob leads Hurley (who in turn, leads Jack) to a lighthouse where they find a bizarre contraption consisting of dials and mirrors that reveal their lives off the island. De Ravin admits to hoping for a happy ending for her character, but given the show's wild leanings, notes anything is possible. "It'd be nice to see her back with Aaron," said de Ravin. "But that could also happen, I suppose, in a (time) flash. It doesn't have to happen in island time." "Lost" returns to CTV on Tuesday. Credit for the photo goes to Lucy Pearl from Fan Forum!! 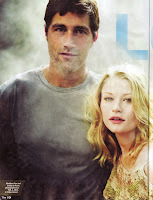 Emilie De Ravin - who plays Claire on Lost, and stars with Rob Pattinson in a new movie, joins us at 7:40 am. Robert Pattinson's Interview About Emilie In "The Advertiser"
Anchor Bay Picks Up "Rogue's Gallery" aka "Operation: Endgame"
It’s no secret that after The Hangover, Zach Galifianakis has been in high demand in Hollywood, and his schedule has quickly been filling up with all kinds of new projects including Todd Phillips’ Due Date, Anna Boden and Ryan Fleck’s It’s Kind of a Funny Story, and the upcoming Shrek spin-off Puss in Boots. His every move is being watched and people are anxious to see what he does next, which is why this recent headline caught me off guard. According to ScreenDaily, Anchor Bay just paid a low seven figure sum for the theatrical, TV and DVD rights to a new “assassin thriller” called Operation: Endgame. The movie just happens to star Galifianakis, so why have we heard nothing about it up until now? Some further research reveals that the movie was shot last year and previously went under the name Rogues Gallery. It is described as an action-comedy about a battle that breaks out among multiple government spy teams after their boss is assassinated. Richard Kelly’s Darko Entertainment produced it, and commercial director Fouad Mikati helmed it. With a cast that also includes Rob Corddry, Maggie Q, Bob Odenkirk, Jeffrey Tambor, Ving Rhames, Emilie de Ravin, Adam Scott and Ellen Barkin, it sounds like Anchor Bay might have a great little film in their hands here. I look forward to seeing a trailer or hearing more about it in the near future. The Picture House is auctioning two tickets to the WORLD PREMIERE and AFTER-PARTY of REMEMBER ME, starring Robert Pattinson (TWILIGHT), Pierce Brosnan (MAMMA MIA! ), Academy Award winner Chris Cooper (ADAPTATION), Academy Award nominee Lena Olin (CHOCOLAT), and Emilie de Ravin (ABC's LOST). Both the screening and party are in New York City. This is a ONCE-IN-A-LIFETIME OPPORTUNITY to see these incredible stars in person and to be the very first to see this highly-anticipated film! The premiere takes place on MONDAY, MARCH 1 AT 7:00PM. The film will be released on Friday, March 12. THE AUCTION BEGINS NOW. Email events@thepicturehouse.org with your bid. The bidding starts at $1,000. The first round of bidding closes on WEDNESDAY, FEBRUARY 24 AT 12:00PM. Only those who placed a bid during the first round will be eligible for the additional rounds of bidding, so MAKE SURE YOU GET YOUR BIDS IN BY WEDNESDAY if you want to win! We will notify the winner on FRIDAY, FEBRUARY 26 AT 5:00PM. NOTE: There is no guarantee that the named actors and actresses will be at the premiere or party, though all are expected to attend. 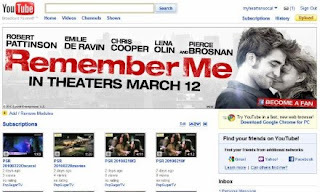 The fact that Robert Pattinson plays the lead in Allen Coulter's 'Remember Me' shouldn't imply that this romantic-drama is anything like the obsessed-about 'Twilight' franchise. On the contrary, with racier scenes (watch an exclusive clip of Pattinson's shower scene with co-star Emilie de Ravin) and darker, adult themes, 'Remember' is a welcome distraction from vampire and werewolf love spats. On Saturday, Feb. 27, we will be interviewing the entire cast of 'Remember Me,' including Emilie de Ravin, Pierce Brosnan, Chris Cooper and, of course, Robert Pattinson. So if you're wondering what it was like for Emilie to film with the media frenzy surrounding Robert, or if Brosnan ever experienced the same reaction from his lady fans, now's your chance to ask them for yourself! Really, you can ask anything you want, just make sure to submit your question before Friday, Feb. 26 in the comments below and to include your name and location. Come back on Monday, March 8 to watch the video interviews and to see if your question made the cut! In order to submit your question click here . I would like to thank http://www.rememberme-film.com/ for the heads up!!!!! Finally here are some comments about Em's performance that were posted in different sites/newspapers/magazines. I would like to express my appretiation to Rachel Leigh for compiling these comments and posting on Fan Forum. I'm pleasantly surprised by how well Emilie de Ravin who hasn't had the world's most interesting character to play all these years, plays bugnuts insane. 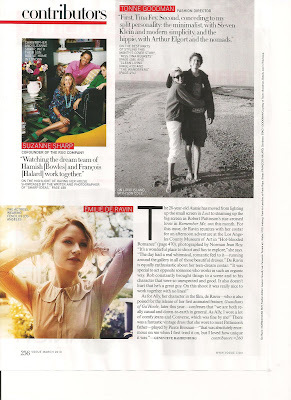 Lindelof also lauds the return of Australian actress Emilie de Ravin, as Claire. ''We're blown away. We think the audience will love her. I have to say, I'm enjoying getting to see the freak-a-deak side of Emilie de Ravin. A special shout out to Emilie de Ravin who is doing a great job of portraying the new, crazy and infected Claire. I don't mind the left turn they took with Claire; it's allowing Emilie de Ravin to sink her teeth into a role with bracing conviction. Emilie de Ravin does creepy well. The best part was when Claire was stitching up Jin's leg and asked, "You're still my friend, aren't you, Jin? If the end of the third episode of this season of 'Lost,' titled 'What Kate Does,' made your jaw drop a little, you're not alone. Just the sight of Claire Littleton -- our long lost 'Lost' friend -- was enough to inspire cheers. But Claire with a rifle, some old fatigues and seriously ratted out hair? Yikes. I caught up with Emilie de Ravin on the set of 'Lost' in Oahu to find out how Claire is doing, mentally, this season on the Island. She also spilled a bit about her new furry friend, her old deceptive friend Locke (who we now know lovingly as Smocke) and the incestuous, Drive Shaft-filled twists and turns to come before the end. Hey -- anything's possible on this show, right? So Claire is crazy, huh? [Laughs] In a nutshell, yes! Mmmhmmm ... I've made myself a squirrel child out of squirrel bones and some kind of fur and little button eyes. He's real cute. Obviously you can't just disappear with your father in that cabin for a full season and not have repercussions, so is this what's happened? Yeah, she's been three years, living on her own, making her own housing and food and protecting herself. The only person she's had contact with as a friend is Locke -- who's not really Locke anymore. So any information that she's been given about what's going on with other people or the Island is from him. And there are maybe some things that are not the whole truth. He's led her to believe that the Others have her baby at the Temple, so that's been her whole plan this last three years, to get him back. Finding out that he's off the Island and Kate is bringing him up is just like a complete, complete shock to her. So there's an interesting relationship with Claire and Kate now -- a combination of animosity, to say the least, and also respect and thanks. So that's been fun playing with. Kind of crazy to think that while Kate was raising Aaron, she was doing so with Jack, Claire's brother. [Laughs] Yes -- we're getting very incestuous on this show! Oh, you didn't read the next episode? [Laughs] I wouldn't be surprised! That's the season finale. Let's talk hair, because wow -- this is a wig, right? Yeah, thank god, right? I probably would've shaved it off by now if this was done to my hair everyday. It's very Rousseau-esque. Are we to assume Claire is just the new Rousseau of the Island? In a respect. Their characters are very different. Traits are similar in a way, but [Claire] is still trying to figure out, at this point, what really is going on, what has happened in these three years, as opposed to just what she's been told. That point of realization -- like, hang on, maybe everything that's been embedded in my mind is not correct -- even though she's so sure about it. So since you're the one playing it, do you think there's a way she can snap out of it? Or will Claire just end up on the Island still crazy? I mean, the evolution this season for her character is sort of coming back to who Claire was. You know, she's still there, underneath it all, even though she's pretty damn loopy. There's still flickers of who Claire is and was, and maybe will be again. Or not. Maybe all it would take is a Drive Shaft song and she'd be back to her old self! Exactly! [Laughs] That'd be funny. 'Wait ... hang on! This Canadian promo is similar to ABC's one but it provides some new shots of Claire. Maybe you’ve heard of this guy, Robert Pattinson? The “Twilight” heartthrob tackles his first major non-vampire lead in this romantic drama about two New York City twentysomethings who discover love helps overcome family tragedies. Pattinson’s love interest is Emilie de Ravin (Claire on “Lost”) and the supporting cast includes classy actors Chris Cooper, Pierce Brosnan and Lena Olin. So is RPattz more or less than Edward Cullen? Here’s your chance to find out. She was dressed as an undercover agent. The scene wasn't too intense, but it was interesting. She was just cornering Marc-André Grondin's character in a parking lot while Emilie de Ravin's character runs in to his rescue. I'm not sure whose viewpoint the film is told from. But it will be a good film. Jean-Paul Salomé is doing a great job directing this film. 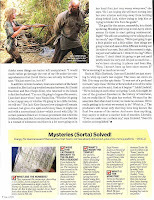 Video: LOST: On Location - Season 6: "What Kate Did"
Thnx to Rachel Leigh from FAN FORUM for this!!! 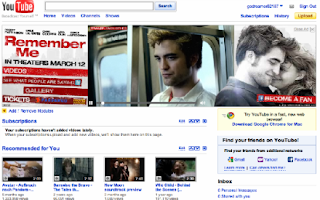 Finally, it was announced that the first Eclipse trailerwill be shown before Remember Me. Thnx to Taragenie from Fan Forum!!! Thnx to LilMouse from Fan Forum!!!!!!! Do you want to see Em in the cover of an upcoming Self Magazine? I would like to thank Lucy Pearl from Fan Forum for this info!!!! Here are the official press releases about Lost's upcoming episodes. Don't read them if you want to stay spoiler free!!!! "Lighthouse" - Hurley must convince Jack to accompany him on an unspecified mission, and Jin stumbles across an old friend, on "Lost," TUESDAY, FEBRUARY 23 (9:00-10:00 p.m., ET) on the ABC Television Network. "Lost" stars Naveen Andrews as Sayid, Nestor Carbonell as Richard Alpert, Emilie de Ravin as Claire, Michael Emerson as Ben, Jeff Fahey as Frank Lapidus, Matthew Fox as Jack, Jorge Garcia as Hurley, Josh Holloway as Sawyer, Daniel Dae Kim as Jin, Yunjin Kim as Sun, Ken Leung as Miles, Evangeline Lilly as Kate, Terry O'Quinn as Locke and Zuleikha Robinson as Ilana. Guest starring are Veronica Hamel as Margo Shephard, Mark Pellegrino as Jacob, Hiroyuki Sanada as Dogen, Dayo Ade as Justin, Dylan Minnette as David and Sean Kinerney as Japanese boy. "Lighthouse" was written by Damon Lindelof & Carlton Cuse and directed by Jack Bender. "Sundown" - Sayid is faced with a difficult decision, and Claire sends a warning to the temple inhabitants, on "Lost," TUESDAY, MARCH 2 (9:00-10:00 p.m., ET) on the ABC Television Network. Guest starring are Kevin Durand as Keamy, Anthony Azizi as Omar/Arabic man, Hiroyuki Sanada as Dogen, John Hawkes as Lennon, Andrea Gabriel as Noor "Nadia" Abed Jaseem, Kimberley Joseph as Cindy, Cas Anvar as Omer, Kailee Velasco as Eva, Aramis Knight as Sam, Peter Stray as doctor, Salvatore Abbadessa as cabbie, David Griffith as screaming Other, Mickey Graue as Zack and Kiersten Havelock as Emma. "Sundown" was written by Paul Zbyszewski & Graham Roland and directed by Bobby Roth. 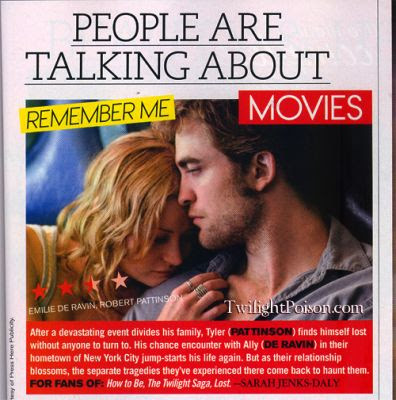 Teen Vogue Gives ‘Remember Me’ Two and a Half Stars! Lost: Ratings for "LA X", "What Kate Does" & "The Substitute"
Opposite fierce competition from NBC’s Winter Olympics and the second hour of Fox’s “American Idol” from 9:00-10:00 p.m., ABC’s “Lost” jumped from its lead-in by 5.6 million viewers (9.8 vs. 4.2 million) and by 200% in young adults (4.5/10 vs. 1.5/4) and grew its audience from start to finish (+6% in viewers/+9% in young adults). In fact in the preliminary Fast Affiliate Ratings, “Lost” defeated NBC Olympic coverage in the 9 o’clock hour by 13% in Adults 18-34 (4.4/12 vs. 3.9/10) and by 41% in Men 18-34 (4.5/13 vs. 3.2/9). Despite the fact that both the Olympics and “Idol” moved into the time period this week, “Lost” exhibited impressive retention of its audience week to week with viewers, young adults and key men: Total Viewers (88%), Adults 18-49 (90%), Men 18-49 (92%) and Men 25-54 (92%). “Lost” stood as Tuesday’s No. 1 scripted TV show for the 3rd week running in Adults 18-49, Adults 18-34 and across key Men (M18-34/M18-49/M25-54). Despite facing stiff, established time-period competition on CBS (“NCIS: LA”) and NBC (“Biggest Loser”), as well as Fox’s “American Idol”-inflated series debut of “Past Life,” ABC self-starter “Lost” shot up from its lead-in by 6.1 million viewers (11.0 vs. 4.9 million) and by 188% in young adults (4.9/12 vs. 1.7/4) and built its audience from start to finish (+4% in viewers/+6% in young adults). “Lost” dominated the 9 o’clock hour for its 2nd straight telecast in the key young Adult sales demo, defeating its nearest competitors by 23% (CBS and NBC tied at 4.0/10) and fourth-place Fox by 58% (3.1/8). On its new night, “Lost” qualified as Tuesday’s No. 1 scripted TV show for the 2nd week in a row in Adults 18-49, Adults 18-34 and across key Men (M18-34/M18-49/M25-54). “Lost” was up from its performance on the same week last year by 1.2 million viewers and by 11% in Adults 18-49 (9.8 million and 4.4/10, Wednesday 9:00 p.m. on 2/11/09). “Lost” delivered enormous year-to-year time period improvement for ABC, boosting the hour by 6.6 million viewers and by 125% in Adults 18-49 over the year-ago night with original programming (4.4 million and 2.0/5 – originals of “Scrubs”). 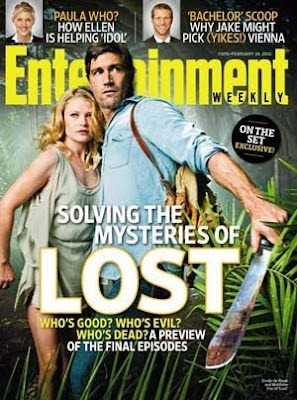 Excluding only last week’s sixth-season premiere, “Lost” posted its highest-rated telecast in nearly 2 years among Adults 18-34 (5.0/14) – since 2/21/08. Opposite Fox's "American Idol" and CBS' top-rated "NCIS," ABC's "Lost: Final Chapter" recap special drew 10.0 million viewers and a 4.1 rating, 11 share in Adults 18-49, offering a strong lead-in to the show's season opener. 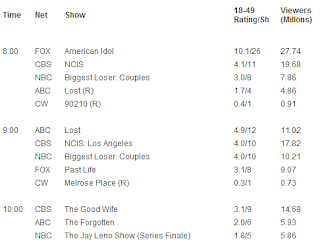 The clip-show took second place to "Idol" in the hour, beating "NCIS" with Adults 18-34 and key Men (M18-34/M18-49). * Across the key Adult demos (AD18-34/AD18-49/AD25-54), the special generated ABC's 2nd-highest numbers in the hour this season. ABC's "Lost" opened up its 6th season on a new night against stiff original competition (CBS' "NCIS: LA"/NBC's "Biggest Loser"/Fox's "Idol"-fueled "Kitchen Nightmares") with a definitive Adult 18-49 victory, beating out its nearest 9:00-11:00 p.m. competitor by 49% (5.5/14 vs. 3.7/9 - NBC's "Biggest Loser"). "Lost" dominated all 4 of its half-hours in the key young adult sales demo. In a good sign for future viewing, the drama held steady with a 14 audience share through its first 3 half-hours, and then grew to a 15 a share in its final half-hour. * ABC's "Lost" stood as Tuesday's No. 1 scripted TV show across the key Adult demos (AD18-34/AD18-49/AD25-54). * "Lost" was up from its year ago season opener (on Wednesday, 1/21/09) by 6% in Total Viewers (12.1 million vs. 11.4 million), by 10% in Adults 18-49 (5.5/14 vs. 5.0/12) and by 20% in Adults 18-34 (5.5/15 vs. 4.6/13). The Lost premiere produced the series' highest-rated telecast with Adults 18-49 and Adults 18-34 in nearly 2 years - since 2/21/08 and 2/7/08, respectively. * The 6th-year ABC drama premiere generated the Net's top series numbers in the 2-hour time period since November 2007 with Adults 18-49 and since May 2000 with Adults 18-34 - since 11/27/07 and 5/2/00, respectively. Please Note: One of the most recorded and played back shows on TV, on average last season in originals "Lost" saw its overall audience grow by 1.8 million viewers and jump 23% in Adults 18-49 (+1.0 rating point) from its first-reported Live + Same Day and finalized Live + 7 Day numbers.